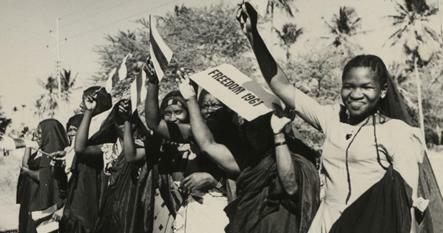 Africa through a lens is a set of thousands of images taken from a broader photographic collection of Foreign and Commonwealth Office images, held at The National Archives. Starting with some incredible early photographs from the 1860s, the images span over 100 years of African history. These images are now available, for the first time, to view online. The collection was brought about by the request of the Secretary of State for the Colonies in 1869. He asked governors to arrange for the taking of photographs of ‘noteworthy buildings and scenery … together with individuals of various races peculiar to the colony’. Each governor interpreted the task in his own way, which has culminated in this unique and varied collection. The original records include what appear to be personal scrapbooks, official albums, printed pamphlets and even framed photographs and paintings. Some images are official public information shots, others are hand drawn sketches. The number of images for each country also varies, depending on how diligently the request was carried out. The collection covers just over 20 African countries from the 1860s up until the 1980s. The photographs help illustrate stories from Africa; from the ‘Scramble for Africa’ in the late 19th Century through to the independence of the African nations in the 1950s and 1960s. Included are pictures of chiefs, tribesmen and villages, famous landmarks, notable events, schools, farming and wildlife. Several photos show the construction of roads, bridges and harbours, while others show the development of industry, training and education. There are also images of demonstrations and celebrations of independence. In 2008 The National Archives acquired the Colonial Office photographic collection from the Foreign and Commonwealth Office. Following conservation work to ensure the future preservation of the images, the series has been digitised. This means we can provide online access to this stunning and rare collection of images, worldwide. We are beginning this project with Africa.